(Photo: © UNHCR/Fabio Cuttica)Venezuelans cross the Simon Bolivar International Bridge into the border city of Cúcuta, Colombia in October 2018. 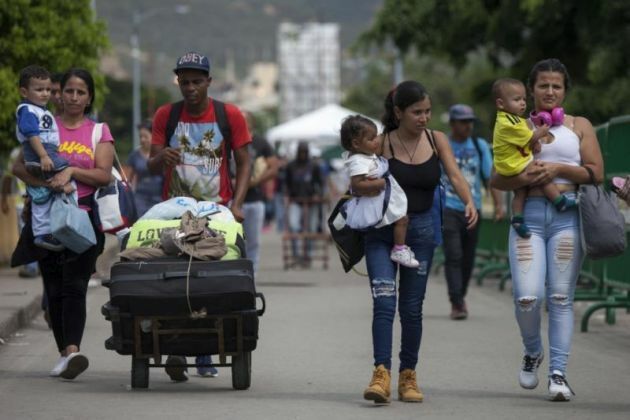 The Catholic Diocese of Cúcuta in Colombia says it has provided one million meals to Venezuelan migrants affected by the humanitarian crisis in their country. The diocese on March 18 thanked the volunteers and donors who since June 5, 2017, have provided support to those affected by the emergency at the Colombian-Venezuelan border, Catholic News Agency reported. "As the Holy Father Francis has well reminded us, the Church is like a field hospital where wounded people come seeking the goodness and closeness of God," Bishop Víctor Manuel Ochoa Cadavid said. The United Nations High Commissioner for Human Rights, Michelle Bachelet had said on March 20 that the magnitude and gravity of the human rights impact of the current crisis in Venezuela is "a worrying destabilizing factor in the region." She said that Venezuela's health system continues to deteriorate, with a very significant impact on maternal mortality and morbidity and infant mortality. Bachelet cited a recent survey, she also noted that more than 1 million children no longer attend school in Venezuela, mostly because of their parents' inability to feed them breakfast, the failure of schools' food programs, and a lack of affordable public transportation. Currently, thousands of Venezuelan citizens live on the remittances that relatives send them from abroad. However, only a maximum of 6,000 bolivars a day can be withdrawn from the bank, which amounts to about US$2.00. Many of those Venezuelans have fled to Colombia. The Diocese of Cúcuta serves the migrants through the Divine Providence House of Transit in addition to eight parish soup kitchens. Speaking on RCN Radio on March 19, Father David Cañas, the coordinator of the Divine Providence House, said that between 3,800 and 4,200 people arrive daily, starting very early, in search of food. Bishop Ochoa voiced gratitude for "the 800 Catholic volunteers, men and women religious, priests and deacons, donors, coordinated by Father José David Caña Pérez, [who] make it possible for the Diocese of Cúcuta to become a prophetic witness of the charity of the Church." Ochoa also thanked the institutions that have donated food, money, and resources to make the program possible: the World Food Program, the United Nations High Commissioner for Refugees, Caritas International, Adveniat, and the United States Conference of Catholic Bishops.